ProjectionsIO is a video capture and sharing app, which allows us to clip, edit and share the most hilarious, heartbreaking or exciting moments of our favorite TV series, movies or other streamed content. Tune in on any given Twitch or YouTube live channel, and you're likely to witness something you'll want to tell your friends about, or maybe you are more of a TV show and movie buff and you want to share those exciting and exhilarating Game of Thrones moments with all your friends. Whatever the case, ProjectionsIO is the perfect app for you. ProjectionsIO is a video clipping social app with which users can instantly capture and share any moment of their favorite streaming content like TV shows, movies, Twitch or Youtube gaming content and more. The app support clipping content from streaming networks like Netflix, Hulu, HBO, Amazon, Twitch, Youtube and others. Clipping, editing and sharing video content with ProjectionsIO is easy and instantaneous. With the ProjectionsIO app you can remotely control your streaming content, pausing it, rewinding or forwarding it, making it easier to find and capture those specific moments. After you capture the wanted scene you can edit and remix the clip and even add your own captions. ProjectionsIO also comes with a patent-pending embed and delivery feature which connects any shared clips on its feed or social media with the original content providing a unique new way of content discovery. 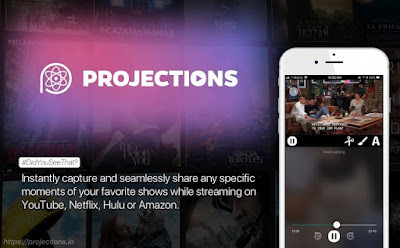 ProjectionsIO is one of the best clip based social app for every TV show and movie buff. You can find the ProjectionsIO app and extension on iTunes App Store and the Google Chrom Web Store completely for free.